URBANA, Ill. –The state of Illinois has released $10 million to University of Illinois Extension, including $8.35 million to match contributions from county boards. Led by Senate members Scott Bennett (D-52) and Chapin Rose (R-51), legislators across the aisle worked with their caucuses, their leadership, the Illinois Department of Agriculture, and the Illinois Comptroller’s Office to ensure funding for the essential Extension programs that serve individuals, families, and communities in all of Illinois’ 102 counties. Although Extension was budgeted to receive full funding by the governor and legislature in Fiscal Years 2017 and 2018, it had not received the payment since 2015. “I am deeply grateful for the bipartisan efforts that were made to release this funding, and especially thank Senators Rose and Bennett for bringing this issue to the attention of other lawmakers in Springfield,” said Kim Kidwell, dean of the College of Agricultural, Consumer and Environmental Sciences, which administers Extension. “This funding allows us to begin to get back on track with matching contributions from counties to fund essential programing in their areas. We appreciate the patience, support and commitment county boards demonstrated to 4-H and Extension during this funding crisis,” Kidwell said. 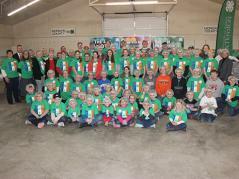 The recent payment also includes $1.2 million for Cook County Extension programs, where nearly half of Illinois residents reside, and $496,840 towards youth education that will support 4-H programs. An additional $3.4 million in state funds budgeted for Extension in FY 2017 and 2018 remain to be disbursed, which includes $1.6 million in county board match. “This progress is a great example of both parties coming together to support a program that matters to everyone, as Extension programs serve every county – all ages, genders, and walks of life,” said Interim Director of Extension Shelly Nickols-Richardson. Extension reached 1.3 million participants with in-person education and trained 23,000 volunteers in 2017, helping Illinois residents improve agricultural practices, protect their environment, improve family nutrition, build strong local economies, and receive professional training. Established by the Smith-Lever Act of 1914, University of Illinois Extension in the College of Agricultural, Consumer and Environmental Sciences is a mission-critical component of the university. Extension’s services include well-known programs such as 4-H, rural and urban agricultural training, Master Gardener and Master Naturalist volunteer programs, nutrition education, and economic development programs for local governments.